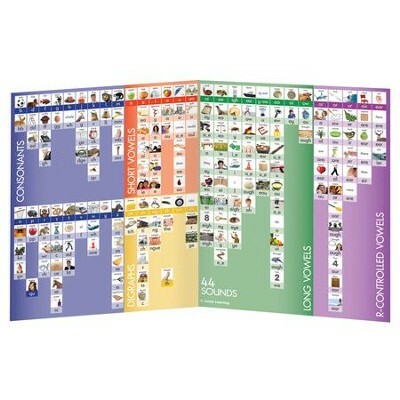 The 44 Sounds Board provides alternative spellings for all of the 44 sounds of English. Sounds are grouped into: consonants, short vowels, digraphs, long vowels and r-controlled vowels. Picture prompts are provided throughout. Ledger size (11" x 17") folded and laminated on thick cardboard that can be used for spelling or practicing the sounds of graphemes. Double-sided, the other side displays the 49 most common digraph patterns with picture example and word examples for each. Perfect for home or school use. Ages 5+. I'm the author/artist and I want to review 44 Sound Board.